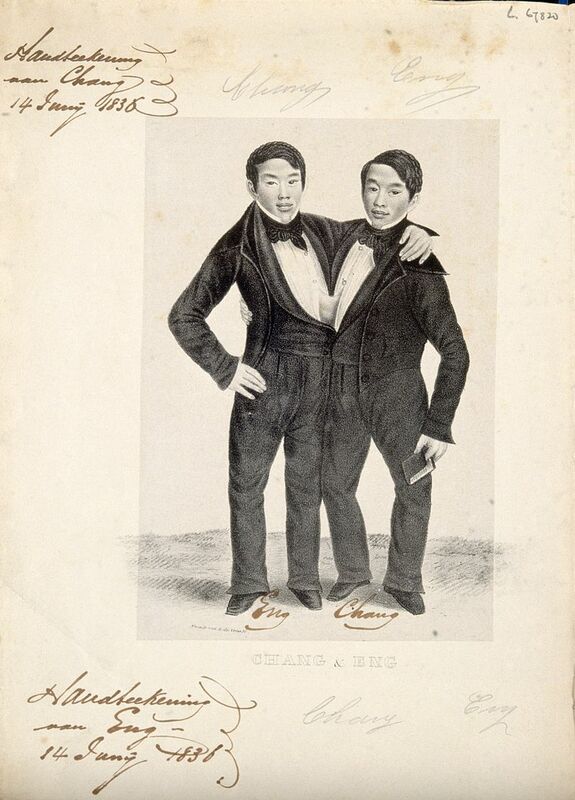 Chang and Eng, famous conjoined twins, were born on this date in 1811. Because they were born in the kingdom of Siam (later Thailand) they were known in the West as the “Siamese twins,” and that name, for many decades, was given to their condition in general. 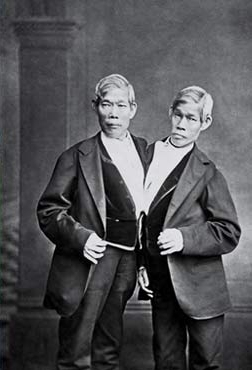 Obviously, though, being conjoined is not unique to SE Asians, so the term “Siamese” has been dropped to avoid ethnocentrism. 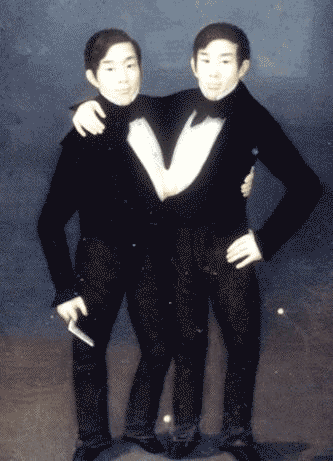 Chang and Eng were born in the province of Samutsongkram, near Bangkok, in the old kingdom of Siam, so it is historically correct to call them Siamese and not Thai. Their father was Chinese, and their mother was half-Chinese and half-Malay. Because of their Chinese heritage, they were known locally as the “Chinese Twins.” They were joined in a way which nowadays would make it routine to separate them soon after birth. They had separate circulatory systems as well as independent organs, with the slight exception of their livers which were functionally separate but biologically fused. In 1829, Robert Hunter, a Scottish merchant who lived in Bangkok, saw the twins swimming and realized their potential. He paid their parents to permit him to exhibit their sons as a curiosity on a world tour. When their contract with Hunter was over, Chang and Eng went into business for themselves. In 1839, while visiting Wilkesboro, North Carolina, the brothers were attracted to the area and bought a 110-acre (0.45 km2) farm in nearby Traphill. Determined to live as normal a life they could, Chang and Eng settled on their small plantation and bought slaves to do the work they could not do themselves. They became naturalized U.S. citizens, adopting the name “Bunker,” and married local women on April 13th 1843. Chang married Adelaide Yates (1823-1917), while Eng married her sister, Sarah Anne (1822-1892). The couples shared a bed built for four in their Traphill home. 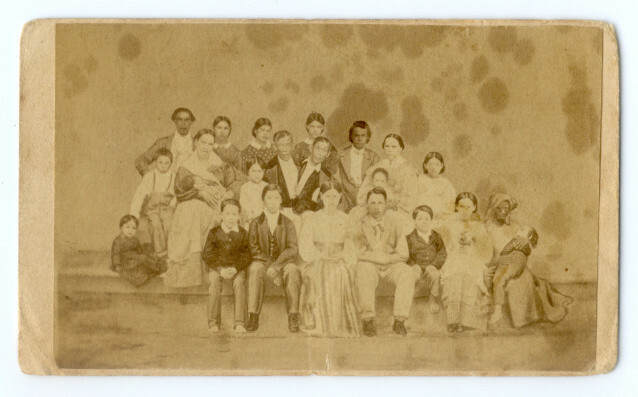 Chang and Adelaide had twelve children, and Eng and Sarah had ten. After a number of years, the sisters began to get into disputes with one another, so separate households were set up west of Mount Airy, North Carolina in the town of White Plains. The brothers alternately spent three days at each home. During the American Civil War, Chang’s son Christopher and Eng’s son Stephen both served in the Confederate army. The twins lost most of their money with the defeat of the Confederacy and became very bitter. They returned to public exhibitions, but this time they had little success. In 1870, Chang suffered a stroke and his health declined over the next four years. He also began drinking heavily (Chang’s drinking did not affect Eng as they did not share a circulatory system). Despite his brother’s ailing condition, Eng remained in good health. Shortly before his death, Chang was injured after falling from a carriage. He then developed a severe case of bronchitis. 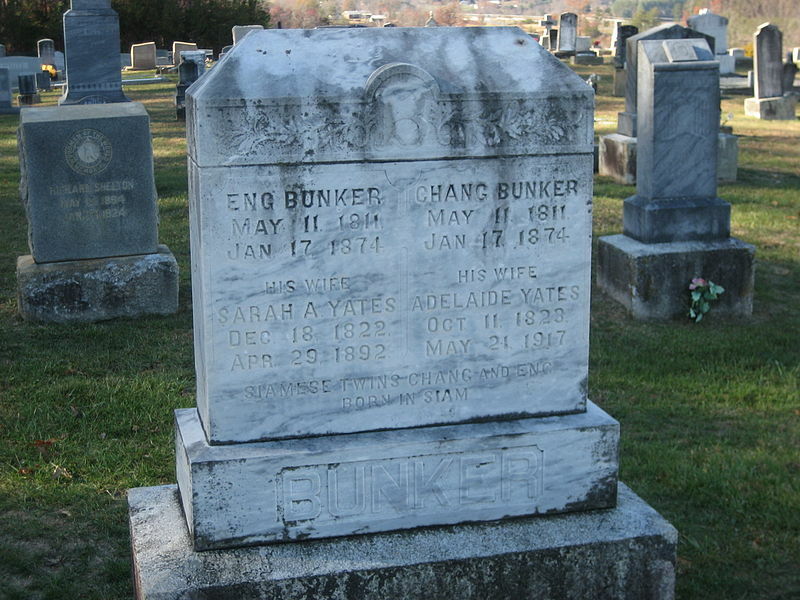 On January 17, 1874, Chang died while the brothers were asleep. Eng awoke to find his brother dead and cried, “Then I am going”. A doctor was summoned to perform an emergency separation, but he was too late. Eng died approximately three hours later. At the time of Eng’s death doctors attributed it to shock induced by the fear of impending death. But modern specialists discount this claim, and cannot determine his cause of death at this point. Thai cuisine is becoming increasingly well known in the West because of a dramatic increase in the number of restaurants in the past 20 years. They do all tend to serve much the same dishes, however, which is fine, but a bit limiting. Go to Thailand and you will find much more variety, and a greater diversity of ingredients. 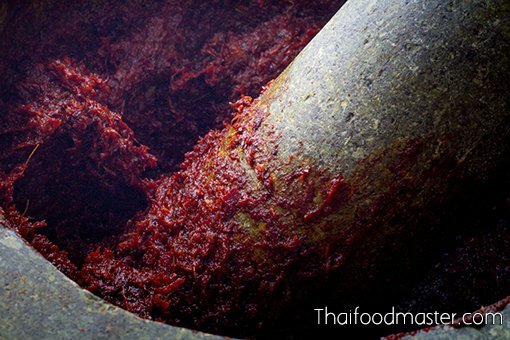 This website gives a fairly good sense of the greater diversity and authenticity within Thailand and historically: https://thaifoodmaster.com One recipe from the site that comes from a 19th century cookbook is for tom kha bpet. You’ll find tom kha on menus in Thai restaurants in the West, but now it is a chicken and coconut soup. Originally tom kha bpet was sliced duck or chicken which was poached, whole or jointed, in coconut milk with galangal, and served with a spicy chile-garlic sauce. Here I will give you the sauce recipe only. It should not tax your cooking skills too much to figure out how to poach a chicken in coconut milk and galangal. You can find galangal at Asian markets in the West, but make sure you use young galangal. For the sauce you need coriander roots, Thai garlic, Thai chiles, and Thai shallots. Good luck finding them in the West. I could find them sometimes in ethnic markets in Yunnan, but I’ve never seen them in the West. You want the long Thai chiles, not the tiny devil-hot ones. Over a hot grill, preferably using wood charcoal, lightly char the chiles, shallots, garlic and shrimp paste. Keep an eagle eye on the ingredients, turning them often to avoid burning. Peel the shallots, and either in a mortar and pestle (preferable), or in a food processor, grind all the charred ingredients together to make a paste. Add the fish sauce, lime juice, and palm sugar and stir to mix everything thoroughly. 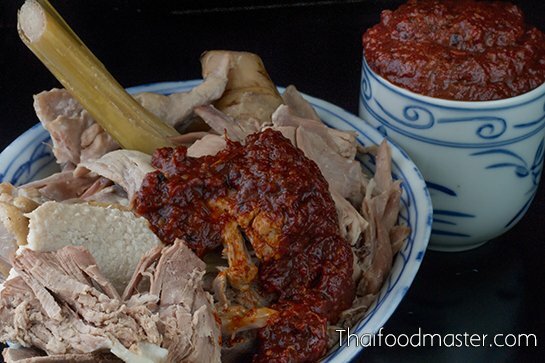 Serve as a dipping sauce for sliced chicken or duck. In Belgium we sure still call them that way! & the way they split their time over their families. of finding out his other half died! Though it seems nearly logical too. After all they were 1, not really separate systems. I think some people still call them Siamese twins in England and the US too, but it’s very old fashioned now. In the past conjoined twins died within hours of each other because they usually shared organs. Chang and Eng did not, so it remains a mystery.